Here are photos from making a wool duvet comforter before Christmas. I didn't want to post them until after giving it as a Christmas gift. Warning: this is just the way I do this and it seems to work for me. If you find yourself with lots of extra wool, you might want to make a few of these for your family too. First, start out with a queen size comforter batt (about 4 pounds of wool, I have my coarser britch wool made into quilt batts - coarse Shetland and BFL isn't really that coarse) and two queen size flat sheets. I don't bother buying real expensive sheets for this anymore, the wool has a tendency to migrate out of the sheets regardless. I'll never forget the night poor Stan was snoring away and inhaled in a wool fiber from my first comforter in the middle of the night. Oh the coughing! It lasted for such a long time despite his getting drinks of water. It's funny now, but I didn't dare tell him at the time that I knew what had happened. After that night I vowed to put the comforter in a duvet like I should have done in the first. It makes all the difference. Okay, sew the sheets right sides together at one end. Then spread one sheet out flat on the living room floor wrong side up. Now unroll the wool batt on the sheet...I love the batts Zeilinger's makes, they are all one piece! Here is the batt completely unfolded on the sheet. If you don't have one solid queen size batt, just lay the lengths of batting evenly over the sheet. You can adjust the batt to fit, but make sure you have enough room on the unsewn sides to fold the edges in and pin them together... Here it's all pinned together...don't try to sew the edges together yet! First you need to tie it together with a needle and some handspun yarn. I don't have any quilting equipment so I just kneel on the quilt and start with a tie smack dab in the center. Then I add another one half way between the first tie and the edge, working in all four directions. From there I add ties midway between the ties and eventually it looks like this... You can sew the folded edges together anytime after you've got enough ties in place to keep the batt from clumping up. I just top stitch 1/4 inch from the edge all the way around, including the sewn side. The whole project only takes a couple hours. Wool is so nice to sleep under, we use our 5 pound quilt only during the fall, winter and spring though. It's too heavy for summer use. But I'd bet a lighter weight wool comforter would be just fine in the summer. That is really cool! I may have to try it at some point. Great pictures and description. I have several wool comforters, and we use ours year round. Good to know who does a good job of making them. How are they for prices? Hi Becky! I stumbled on this blog post as I was googling 'make a wool comforter' or something like that. This is exactly what I needed! Say, Zeilinger's has two wool bats available — quilt and comforter. I emailed them to ask what the loft what for the two different bats and they said approximately 2" for the quilt and 4" for the comforter. I noticed in your post you used the word quilt and comforter, so I'm just wondering which one you used to make your duvet. Seeing as your post is 8 years old(! ), I'm also wondering how the comforter held up over time. Does the loft get compressed overtime? Any additional feedback would be wonderful! Hi Michelle, good questions! I'd say these are comforters, not quilts because I don't actually doing any quilting on them. Sorry to mix the descriptors. I still have the first wool comforter I made, it was queen size and weighs 5 pounds. I found that to be a bit heavy, but so nice in the winter. The others I made for the family were twin size and I'm pretty sure the batts were about 2 pounds, maybe 2.5 pounds. Over the years washing the comforters has felted the batting. I know Zeilinger's suggests having the wool re-carded to bring back the loft. 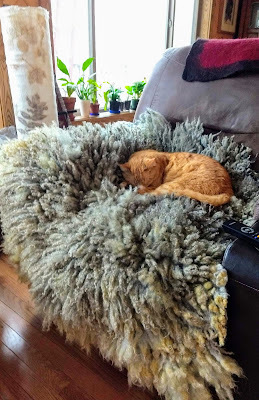 As a feltmaker, I was thrilled to find a twin size felted wool blanket inside the sheets when I decided to cut the yarn ties and take it apart last summer. I thought it would make a great base for a rug or wall hanging. But my friend needed a blanket for a thin sheep this winter and I gave it to her. Anyway, my original 5 pound queen size comforter is a bit lumpy after being washed over the years, but we use it for camping because it warms up so much faster than sleeping bags. Hope this helps! Thanks for the commentary, Becky! I'll be making a king-sized comforter and Z's has that size listed as 5 lbs in the comforter loft option. The quilt option is 2.5 lbs. According to Z's, the bats are processed exactly the same way, the difference is just the loft. I was worried about the weight, so maybe I'll go with the 'quilt' option. I don't plan on ever washing it, just an occasional sun-bathing outside to freshen it up, so maybe it won't get too lumpy. Thanks again!